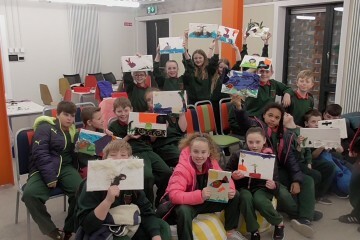 Well done to all the students in 5th Class Gaelscoil Bhaile Munna on their great work and participation in the Biodiversity workshop on 3rd Feb – fantastic animal collages!! At the biodiversity workshops we explore wildlife, habitats, and ecosystems and animal adaptations including camouflage. We host a range of outdoor games will also be included as well as hands-on activities such as making bird feeders, going on a bug hunt and pond dipping.